It was down in the basement of an old craft store in a neighborhood nearby that I found myself in the company of five old women. This is where I learned to knit. I had always wanted to learn this craft and decided the best way to go about it was for someone to teach me by my side. YouTube, though full of good tutorials, was just not doing the trick. Plus, I am a hands on learner and it excited me to get out of the house for a few hours to learn something new. I was pregnant with Theodore at the time, and craved a new hobby to keep my mind from the aches and pains that accompany one throughout pregnancy. These sweet woman were not beginners my any means, but they ever so patient with me. Most already new how to knit, and pretty well at that, and it soon became clear to me that they were merely in the beginners class for camaraderie and conversation. They had tricks up their sleeves and stories to be told. It was so much fun connecting with them and listening to them chat about their grandchildren as I learned to make rows and cast on and off. After several Sunday afternoons looping and clacking my needles together, I learned how to make a pot holder. Success! It was only up from there as that season I made scarves and cowls for many members of my family. I found the rhythm of knitting to be very therapeutic, and something to keep my hands busy while watching shows with Andrew at night. It was something I could pick up and put down easily, a craft that worked anywhere I chose to take it. I liked that about it. 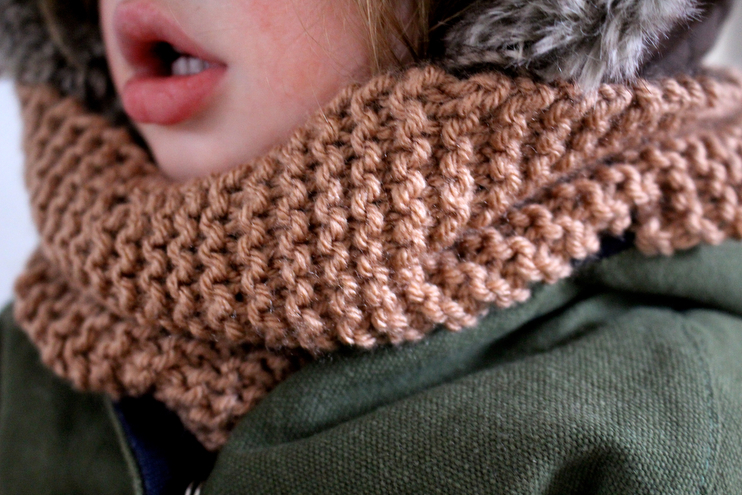 This winter I picked it up again and made a little brown scarf for Theodore. While at the craft store I saw the most lovely shade of taupe wool yarn from a few aisles away. 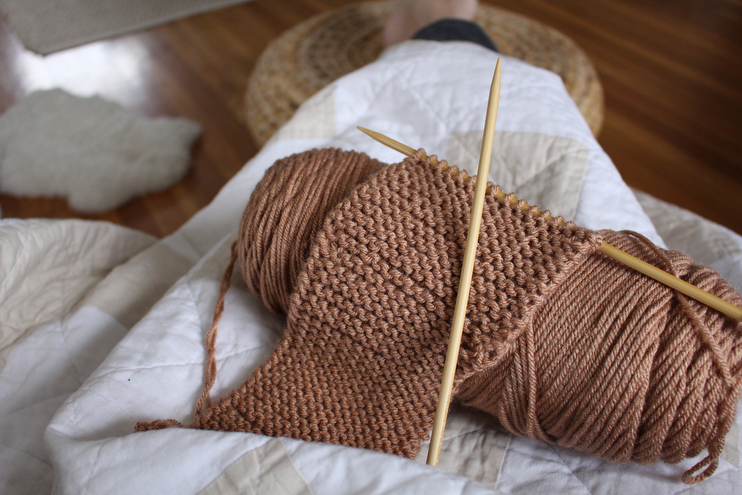 The idea of knitting again hadn’t really came to mind until that color spoke to me and I realized I was in a season (both figuratively and literally) where I could welcome the rest and reprieve knitting invited. There was a sale so I grabbed a few other nice colors and threw them in my basket. Peppered red for Stella, creamy ivory for Alfie, and dusty cloud for Andrew. New winter scarfs this winter for everyone! Theodore wore his new scarf that weekend on our trip to the ice skating rink. It was well below freezing but we made our way to Crown Center to watch daddy and Stella go round and round, their first time skating together. We bundled everyone up and it really was so much fun, despite the cold. Stella did such a great job! With help from Andrew she was able to go around with him about six times, which for a little one, was a big undertaking. 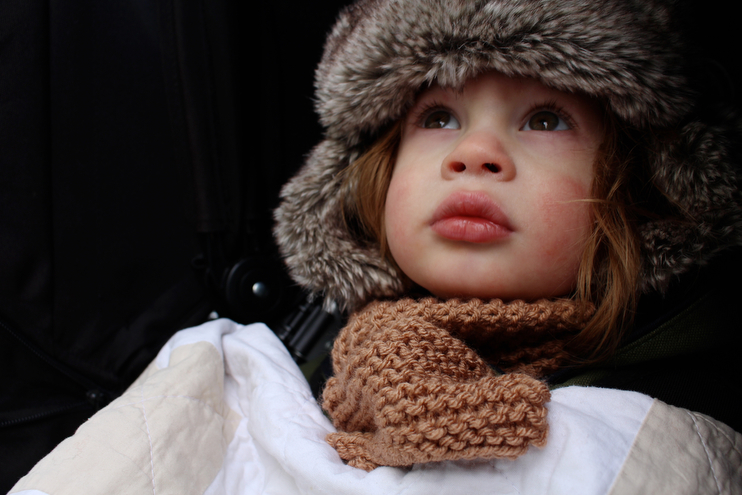 Wrapped snug in his new scarf, Theodore looked on bright eyed, pointing when he saw them rounding the rink. Next year I imagine he’ll be out there to, hopefully wearing his cozy knit made by his mama.